Please fork the XOOPS 2.6.0 code from GitHub and help us in testing and development! The XOOPS Core Development Team is pleased to announce the release of XOOPS 2.6.0 Alpha 2. This is a brand new XOOPS series, with several major changes and enhancements to the Core. You need PHP 5.3+ to run this version! The main goal of the 2.6 series is to update the XOOPS Core and all classes to PHP5 (public, protected, static) and E_STRICT, and to remove / clean up old legacy code and remove all HTML code found in the PHP files. We have extracted from Core several functionalities/behaviors that previously were hard-coded into Core. This will make Core smaller and easier to use. At the same time, modules won't have to go for everything to the Core or to the System module. One of the complaints in the past was that it was hard to extend XOOPS Core. Therefore we've created several new Abstract classes, and as a result, we have decoupled several of the hard coded dependencies from the Core, making it now easier to extend the Core and letting the modules to develop their own implementations. New classes like 'Xoops_Plugin_Abstract' along with the already known 'XoopsPreload' are giving modules new and exciting possibilities. We have added several new classes to make development of XOOPS modules faster and much easier. XoopsFormTab, Xoops_Request, Xoops_Module_Helper, and XoopsLoad::addMap(), are some of the new classes/methods introduced in this version. - You can use XoopsLoad::addMap() to allow class lazy loading, No need to include your classes when you are not using them. -	You can use Xoops_Request to get $_GET,params, $_POST params, cookies, client IP, URI, and many other items. You want to know if the request comes from a mobile device? It supports it too! And you can add many new items. You can also extend the mobile list without hacking the class. -	You can use Xoops_Module_helper if you don't want to type the module name every time you want a Config, a Handler or a Form. It also allows you to get other modules configs, handlers and forms with only one line of code. -	XoopsFormTab? 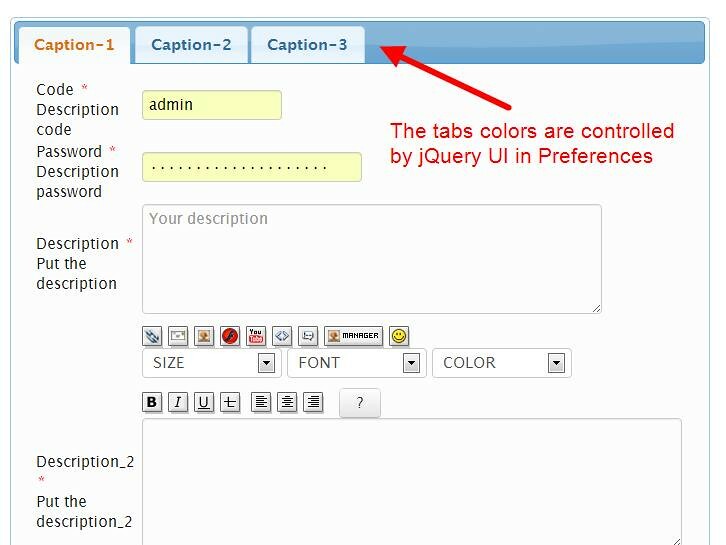 Yes, we have it now to provide Tabbed forms! one of the shortcomings in the past was that we didn't have good documentation for new features. This time we've included a new module Codex, that will show exactly how to use the new features, with well documented code and examples. Since 2.6.0, the backend functionality uses a 'Plugin' interface. The new class Xoops_Module_Plugin is the class that makes using plugins simple and effective! - Page: this is our new simple Content module, that will be included in the basic installation of XOOPS. - Search: Since 2.6.0, the search functionality was removed from core. Now you need to install the 'Search' Module to get search functionality in other modules. The 'Search' module provides a 'Plugin' interface that modules should implement. - System Plugin: The 'System' module provides a 'Plugin' interface to access the System functionality, e.g. to synchronize user’s number of posts, populate the Waiting block, or to access User menus. - User Config: in the past, many of the configuration items were stared in different locations. Now all user-related preferences will be stored in one location. These are just few of the Plugins/Modules. There are more like the Logger, Banners, Avatars, Notifications, xCaptcha, or the xLanguage. And in Alpha 3 we’ll add some more. The Core Team has put a lot of effort to ensure the highest source code quality in XOOPS 2.6.0. The XOOPS 2.6.0 will have no error messages and no red flags in the advanced PHP editors, which will greatly reduce the probability of bugs arising due to typos, variables not set, returning of unexpected values and other frequent mistakes. XOOPS 2.6.0 has now total support for advanced PHP editors, such as phpStorm, which will be now able to deeply understand the code, provide smart code completion for methods, functions and definitions, and quick navigation and on-the-fly error checking. It was possible thanks to implementation of PHPDocs in all classes/functions and by making the code PHP 5.4 compliant. This will improve productivity of our developers who will be able to take advantage of the advanced features of modern PHP editors. We have further improved the implementation of Twitter Bootstrap in the Core, which is our main advanced HTML/CSS engine. This will make developmet of themes much easier, and will provide “Responsive Web Design” for mobile devices “out of the box”. If you are a designer looking to develop new Bootstrap based themes, or a module developer wanting to reduce the size of your framework and have auto-completion at your fingertips, or a webmaster looking for a truly extensible and easy to use CMS, please take XOOPS 2.6.0 for a test drive! The Core Team will now focus on Alpha 3. We have several ambitious goals for Alpha 3 - see our Roadmap. Please provide us with feedback, suggestions - Alpha development is for testing concepts to see what works and what doesn't. We can still modify things in the Core, but for that we need your help and feedback. Your can get this release package from the SourceForge repository. We also highly recommend the installation of the PROTECTOR extension which will bring additional security protection and logging capabilities to your site. Please note: to see Debug info, you need to install and activate the "Logger" extension. This release contains only the "system-related modules and extensions". Unless specifically stated by the module Author, current modules will NOT work properly with XOOPS 2.6.0 Alpha. Great news, guys! I will start testing it right away! From negative experiences, we can draw ideas. I was translating the news when suddenly, I realized that out to the window of the house there is thunder and lightning, with heavy rain. I immediately thought of saving the work I had done up to that point, if you go to see the news on my site, is less than half, when the computer is turned off, because the accumulator that is not working right now antiquated . But from this experience, I was reminded of that blogger, when I write a news, I automatically saves any word I have written. We may do so in the future to xoops? There isnt any theme.html in themes directory ! Sweet! Excellent news, thank you guys for the hard work. Awesome!! XOOPS is the best CMS! Spanish translation published in XOOPS Mexico. @trabis, oops, didn't see that. In version 2.6.0 imagemanager will automatically create the reduced copies of images? I have tested the new xoops version rightnow. First I want to say that you did an amazing work.I really like the look and feel. - during the installation process I have installed the publisher module. unfortunately the image folders for uploads are not created so you get a couple of errors when try to create a category or an article. - I am really happy to see a menu management. this is a really important part of a cms. I have created a sample menu and activated the block but the menu doesn't appear. I am not sure if I am making something wrong. since Alpha 2 released, the xoops 2.6 has many updates. dont use alpha 2 either for bug reporting because I think many of them has been solved. I installed a dev environment for this release yesterday just to see where things were ... and holy hell is this awesome! I haven't been this excited about XOOPS since 2.3 got released! For what it's worth, the changes on the back end and the huge number of changes might be worthy of a bump to 3.x. As the work progresses, I expect there'll be even more reasons which would support this idea. As it stands, I'm beginning to update my UHQ modules to cover some of the things that have changed over the last couple of years I've been largely away. To that end, I think major congratulations are in order to all the core team who have rocked this out. changes i made to the system (like changing time zone) doesnt save ! Also changes to other system setting going back to default, has anyone have this ?